The summer after I moved to my new house I was excited to discover a mature Davidson’s Plum tree at the back of the property. I was excited for two reasons. Firstly it seems that neither bats nor birds are attracted to the fruit, and secondly and very conveniently the fruit drops when ripe and all you have to do is pick it up. You can also use the jam as an accompaniment to duck or pork, or thin it down a little with oil and use it as a glaze for Atlantic Salmon. Wash the plums in a sieve to remove any dust or dirt. Cut the plums in half and remove the two small seeds. Wear gloves if you don’t want to end up with nasty purple fingernails. Peel and core the apple and chop it into approximately 1cm square pieces. Put the plums, apple, lemon juice and sugar into a saucepan and add just enough water to stop the bottom layer from burning (approximately 50mls) – not too much or it will take too long to reduce. Bring the water to a simmer slowly, stirring all the time to ensure that the sugar is dissolved before the liquid starts boiling. Leave on a gentle simmer for at least an hour until the mixture has thickened and reduced. Test the jam by dropping a teaspoonful on the frozen saucer – it should almost immediately thicken. Allow to cool slightly and then spoon into sterilized jars. 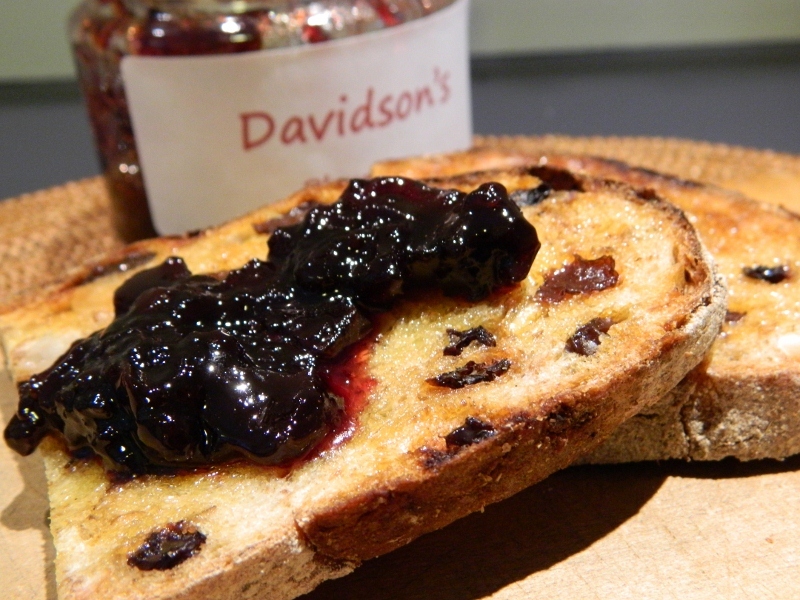 I just did a Google search for a recipe for Davidson’s Plum jam (since I have four fruiting trees at the moment), and guess which page was at the top of my search! I love your blog, especially the frog page 🙂 I’m going to make 2kg of jam tomorrow! Thanks Kevin and lucky you … I have an earlier fruiting variety which dropped all its fruit when I was away in Sydney! Hello Fenella, my parents-in-law have given me a load of plums from their trees, so today is a jam-making day. One question, though – is it 500gm of plums stoned or whole? I guess it doesn’t matter all that much, but I’ve only got one shot at it…Thanks in advance! Hi Mike – I weighed mine whole. Your choice whether or not you remove the seeds. It’s a messy process and they don’t weigh much so I doubt it will make any difference to the recipe. There are two small seeds per plum by the way … good luck. I’m thinking I might chuck the seeds back in the pot, because there’s a lot of plum on them and people can always fish them out as they go. I’ve made your recipe once before, by the way – couldn’t remember what I did last time, but it was a triumph. The vanilla pod is a stroke of genius.